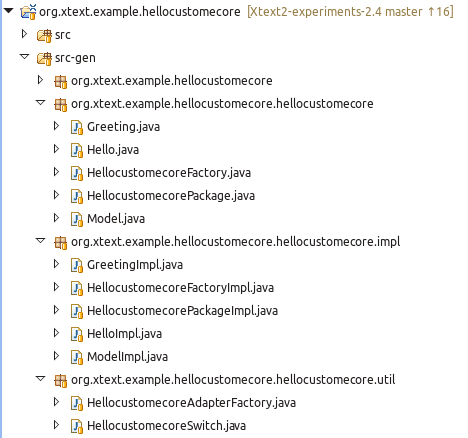 So first of all, let’s create an Xtext project, org.xtext.example.hellocustomecore, (you can find the sources of this example online at https://github.com/LorenzoBettini/Xtext2-experiments); the grammar of the DSL is not important: this is just an example. We will first start developing the DSL using the automatic Ecore model inference and later we will switch to an imported Ecore. and we run the MWE2 generator. 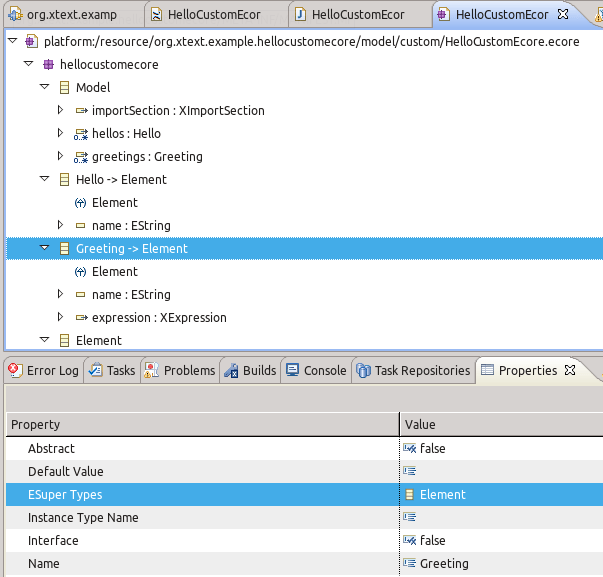 Now, let’s say we want to check in the validator that there are no elements with the same name; since both “Hello” and “Greeting” have the feature name, we can introduce in the Ecore model a common interface with the method getName(). OK, we could achieve this also by introducing a fake rule in the Xtext grammar, but let’s switch to an imported Ecore model so that we can manually modify that. This is the new behavior introduced in Xtext 2.4.3 by the fragment ecore.EMFGeneratorFragment that replaces the now deprecated ecore.EcoreGeneratorFragment; if you still have the deprecated fragment in your MWE2 files, then the Ecore and the GenModel are generated in the src-gen folder. 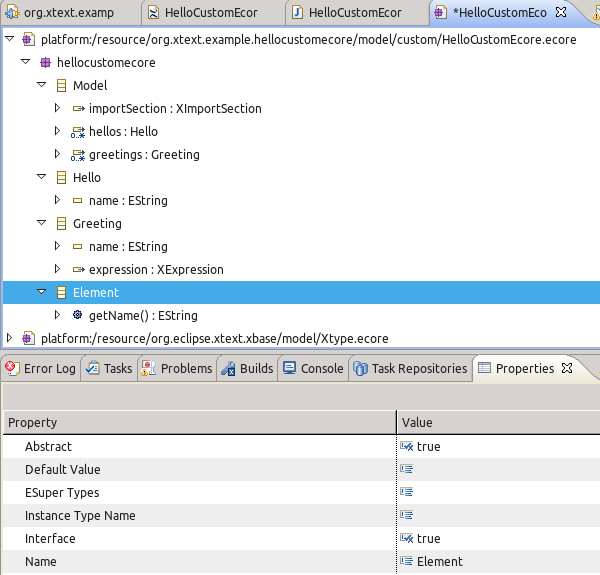 NOTE: if you simply move the .ecore and .genmodel file into the directory model, you will not be able to open the .ecore file with the Ecore editor: this is due to the fact that this Ecore file refers to Xbase Ecore models with a relative path; in that case you need to manually adjust such references by opening the .ecore file with the text editor. From now on, remember, we will manually manage the Ecore file. // The following two lines can be removed, if Xbase is not used. 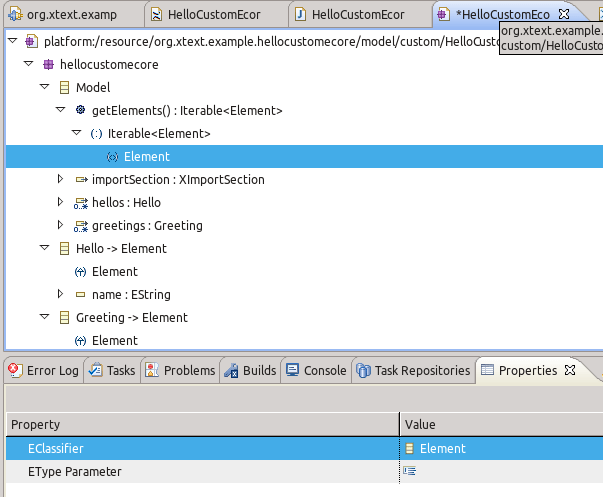 grammar org.xtext.example.hellocustomecore.HelloCustomEcore with org.eclipse.xtext.xbase.Xbase //generate hellocustomecore "http://www.xtext.org/example/hellocustomecore/HelloCustomEcore" import "http://www.xtext.org/example/hellocustomecore/HelloCustomEcore"
And now the Junit tests will run again. 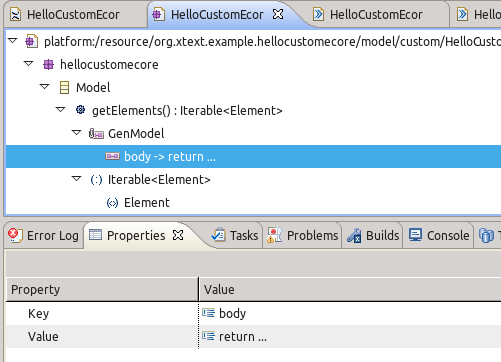 We can now customize our Ecore model, using the Ecore editor and the Properties view. For example, we add the interface Element, with the method getName() and we make both Hello and Greeting implement this interface (they both have getName() thus the implementation of the interface is automatic). Let’s run the MWE2 workflow so that it will regenerate the EMF classes. 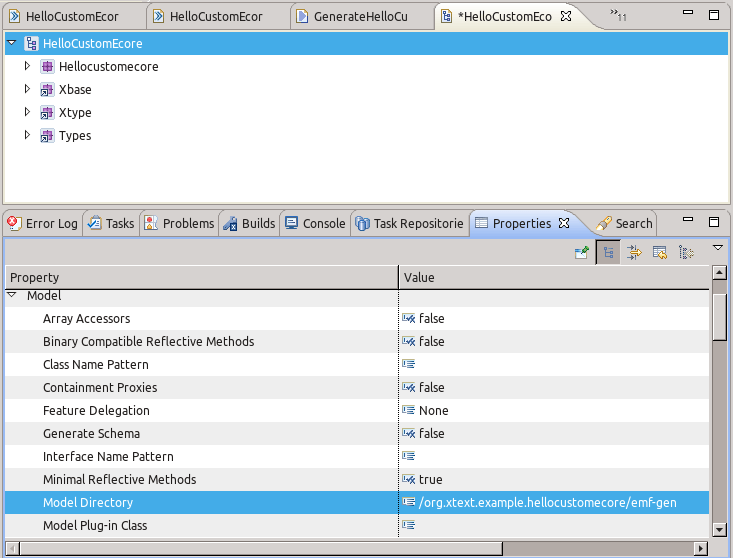 This entry was posted in Tutorials and tagged eclipse, ecore, emf, xtext on February 2, 2014 by Lorenzo Bettini. Thanks, Lorenzo. You help me a lot. 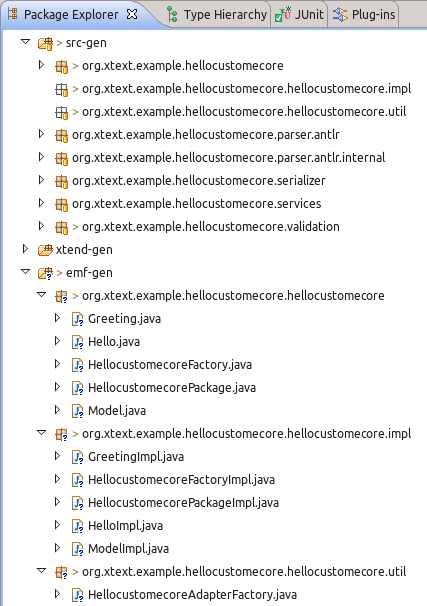 Lorenzo, you possibly should mention — for newcomers — that emf-gen needed to be added to the Java Build Path via Menu Project -> Properties -> Lava Build Path: Source tab. Definitely, your way is much easier! It is important for me, since I have standallone (“headless”) version of my application. After this change all worked fine. Once more, thanks a lot! Oh, Lorenzo, I simply have not followed your text to the very end! Everytthing already was mentiond! Is it possible to remove my previous comment? 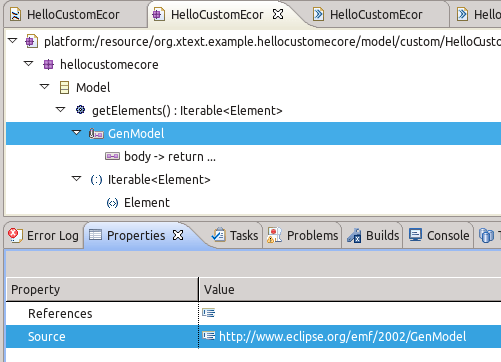 XtextLinkingDiagnostic: null:11 Couldn’t resolve reference to EPackage ‘http://www.eclipse.org/Xtext/example/Arithmetics’. Unfortunately that blog post is out of date w.r.t. the current version of Xtext. 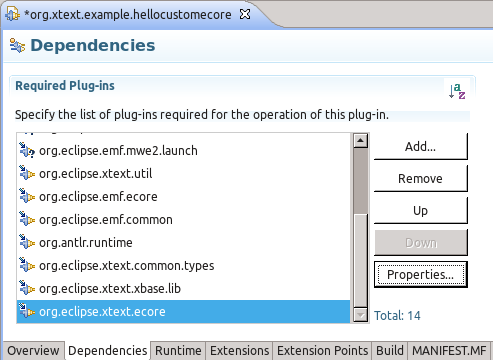 Currently, I’m not using Xcore anymore for my Xtext languages, so I did not have time to update it. I’ll try to have a look at this issue, and try to update the example. I can’t promise I’ll be able to do that in the very near future, I’m afraid.